A vengeful demon barber and a pie lady who's nuttier than a fruitcake...count me in! 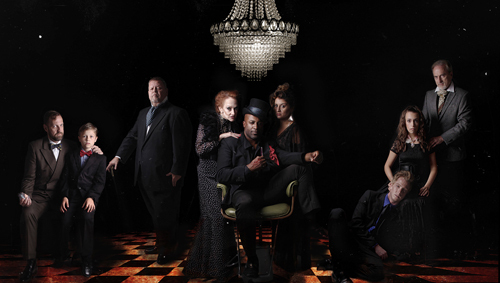 Now showing at Actor's Express through Sunday, February 28, Sweeney Todd: The Demon Barber of Fleet Street is a musical thriller unlike any other performance art you've probably ever seen! Actor's Express is kicking off the new year with one of the greatest American plays, which is actually set in across the Big Pond, in London. As soon as you set eyes on the stage, you feel you're there! 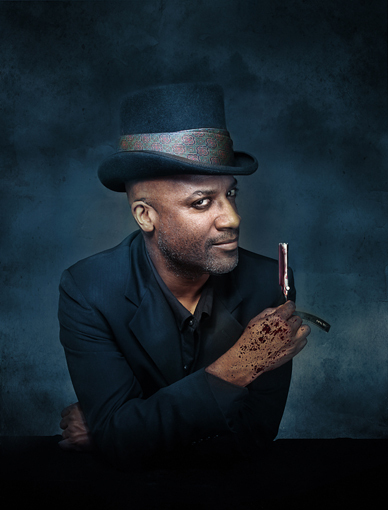 Kevin Harry, who I'd seen perform brilliantly in Rent at Actors Express last summer, is convincingly expressive as Sweeney Todd the demon barber...you can "feel" his vengeance for having been wrongly imprisoned. When he learns that a crooked judge (Michael Strauss) has taken his daughter as a ward, things get even dicier. Sweeney Tood, a wronged barber escapes from prison, returning to his native London to exact revenge on the corrupt judge who unjustly imprisoned him and stole his wife and child. 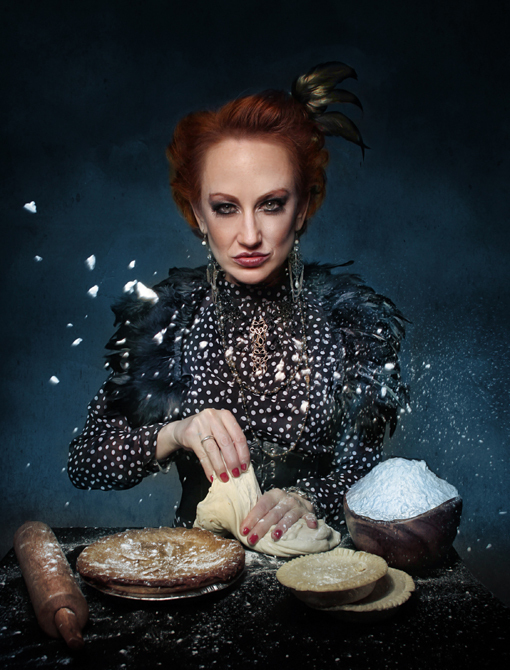 When he joins forces with the lonely pie-maker Mrs. Lovett, he sets into motion a tale of lust, murder, revenge and some really twisted meat pie recipes. Sondheim’s electrifying masterpiece explodes off the Actor's Express stage with raw power and some of the best singing you’ll hear in Atlanta all year. The 1979 Sweeney Todd: The Demon Barber of Fleet Street won multiple Tony Awards, among them: "Best Musical", "Best Musical Score" (Stephen Sondheim), "Best Performance for a Leading Actor in a Play" (Lou Cariou), and "Best Performance for a Leading Actress in a Play" (Angela Lansbury, who I had the pleasure of meeting in February 2004!). I am certain that this brilliant, and beautifully performed musical thriller will be among the top contenders at the next Suzi Bass Awards, the Tony's of Atlanta! There are ample opportunities to fall in love with this play...with its music, with its singing, with its set design and with its characters. I myself fell for Mrs. Lovett, portrayed by the brilliantly talented Deborah Bowman. Among the first songs in the first act, Mrs. Lovett sings "The Worst Pies in London". Although a thriller, it was Mrs. Lovett who had my sides splitting, usually at each revelation of just how insidious a person she is. How is "insidious" funny, you ask? You'll see...if you get tickets before they're sold out! They've sold out quite a few performances already. The entire cast earned a standing ovation—and I'm sure they will night after night. I'd also like to give a shout out to the creative team...outstanding job to all of you! 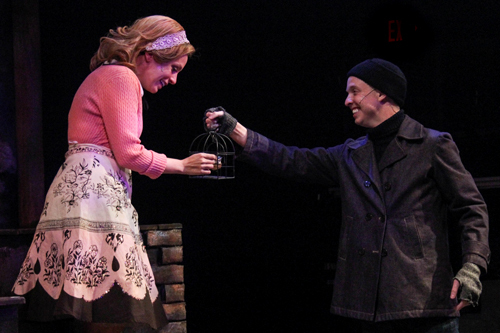 There is one in particular that, to me, stood out as another star of the show...Shannon Robert, the Scenic Designer. I've not met Shannon and didn't know anything about her, but when I saw the set for Sweeney Todd, I knew the person(s) behind it were of a highly talented caliber. The set spans the width of the theatre, with the audience seated on the flanks, and a few seats on the stage floor! The set is 360°! It's a wide band that covers the walls AND the ceiling! It's so brilliant that regardless of where a particular scene is taking place—on Fleet Street, in the pie shop, in the judges home—you feel like you're actually there. Oh, and speaking of band...the music that accompanies the play is performed live! Seeing Benjamin Davis (Anthony) perform again—he too was in Rent at Actor's Express last summer—was indeed a treat. His energy is beams, his voice is superb, and he's a bright light in this otherwise dark tale. He's the Prince Charming for the show's damsel in distress. But he's even more than that...he's a hero. Johanna, gorgeously performed by Kelly Chapin Martin, is so adoringly lovable, your heart goes out to her from the instant she takes the stage. Her innocent life is interrupted by love-at-first-sight and again by forced relocation. Although an avian enthusiast—particularly for finches, linnets, nightingales and blackbirds—her flight doesn't exactly entail a respite in sanctuary. The first glimpse between Anthony and Johanna is akin to a scene in Romeo & Juliet. It's just as tender and loving, but the rivalry behind the story's families is tortuously twisted and complicated. Their story is as tragedy-filled as our beloved Shakespearean tale. Still, one holds out hope for the lovebirds throughout the play. This second half of the show is markedly more fast-paced, so pay attention...there are a lot of twists and turns and slices and surprises and you will not want to miss a single one! Among the surprises...well, I'm not going to spoil it for you, but I will share that there was more than a few that I totally did not see coming! 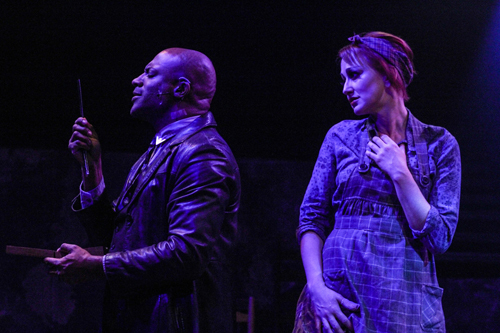 Sweeney Todd: The Demon Barber of Fleet Street is at Actor's Express through Sunday, February 28. Treat yourself to a slice of dark drama with a sprinkles of humor. A word of advice: shave before you go. Thank you, Actor's Express for the tickets! As always, the opinions shared on my blog are my own. You might find it of interest that Actor's Express opened in 1988, the year after I first moved to Atlanta, and I was a big fan from the beginning. I was away in DC for a number of years, but I find myself super excited to find myself again in the audience of such magnificently performed shows at Actor's express. Thank you, again!